REA's 1863 Harry Wright CDV was sold alongside the fraudulent and trimmed Gretzky-McNall T206 Honus Wagner in an REA/MastroNet sale in 2000. Robert Edward Auctions has made quite a fuss over its offering of an 1863 cricket CDV of Harry Wright in an attempt to establish it as the “First Baseball Card.” REA president Rob Lifson goes on at length about the research his company has conducted to make the case that the CDV purchased for $83,543 by Keith Olbermann in a 2000 REA/MastroNet auction should be considered for the loftiest of titles in the card-collecting realm. Lifson’s research is nothing ground-breaking or original, as most of it was already conducted by the consignor who placed the CDV with MastroNet to sell in 2000. It was the consignor who researched the New York Public Library’s “Harry Wright Notebooks” and discovered the entries related to the production of the Jordan & Co. CDV-cricket tickets. In fact, a source familiar with REA’s own recent research at the NYPL says that Lifson did not view any library materials and asked librarians just one question. In his lot description, however, Lifson thanked NYPL librarians stating that they were “accommodating above and beyond, to the point of doing research for us.” There is a certain irony in Lifson’s recent claim as the auctioneer was once apprehended stealing similar CDV cards from the NYPL’s Spalding Collection in 1979 while attending the Wharton School of Business. 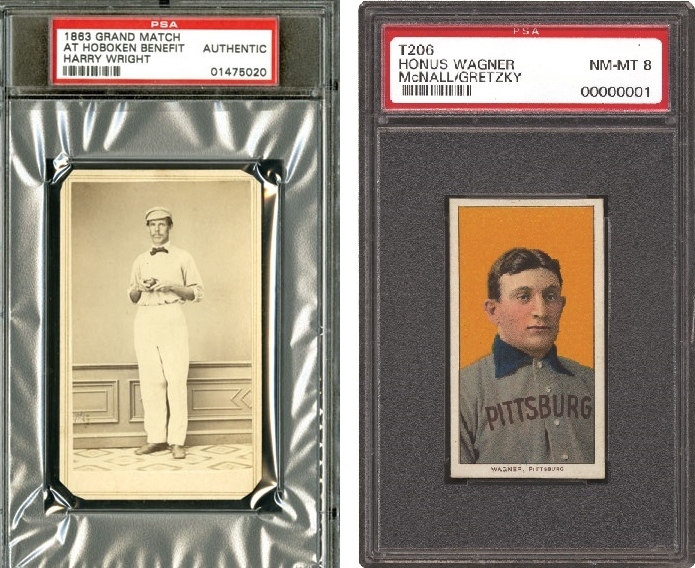 Based primarily upon the research conducted by the original consignor, Lifson made the same case for the Wright CDV back in 2000 when he sold it in the same auction as the now infamous Gretzky-McNall T206 Honus Wagner card. It was in that REA/MastroNet sale that several sources allege Lifson and his partner Bill Mastro defrauded winning bidder Brian Siegel because both men had full knowledge that Mastro had trimmed the Wagner card to enhance its condition and value a short time after both men purchased the card in a Long Island card shop in 1985. Lifson’s new research, however, fails to note that two other cards issued with the Wright CDV, of William Hammond and William Crossley could also lay title to the “First Card” based upon his criteria. Both Hammond and Crossley also played in the same “Grand-Match” baseball game that Harry Wright did in conjunction with the CDV-tickets. Keith Olbermann, a prolific collector of baseball cards, shows off his T206 Wagner to Tim Hudson (MLB.com); The Harry Wright CDV he bought in 2000 is currently for sale via Rob Lifson (right) who is shown bidding on the trimmed Gretzky Wagner at Christie's in 1996. With no supporting evidence, REA and Lifson appear to be suggesting that someone in Wright’s family or perhaps a close relative may have consigned the photo album to Butterfield’s in 1997 and that Lew Lipset received the Wright CDV and other items with the album as a consignment from a third party. But in 2013, rare photographs and CDV’s of the “Father of Professional Baseball,” Harry Wright, immediately call to mind the myriad of missing portraits from Wright’s personal archive housed at the New York Public Library as part of the A. G. Spalding Baseball Collection. There are over twenty missing portraits and tintypes of Wright and close to two-thousand missing documents that were once housed in library scrapbooks made to secure his personal correspondence. In his last will and testament Wright bequeathed his entire baseball archive of papers and photographs to the National League so that it would constitute the “nucleus” of a collection that could one day be studied for insights into the game’s earliest days. Hall of Famer and National League president A. G. Spalding incorporated Wright’s archive into his own and after he passed away in 1915 his widow decided to donate the entire treasure trove to the NYPL. 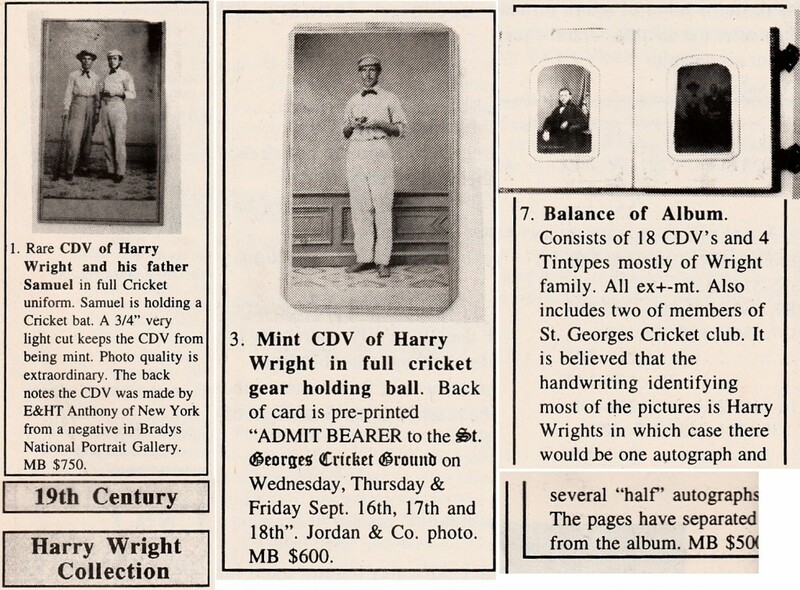 The Wright family CDV album containing what REA calls the "First Baseball Card" featuring Harry Wright mysteriously appeared in a Butterfield & Butterfield auction in California in 1997. Guzzi and her side of the family retained just one relic from Grandpa Harry’s baseball-days, a rather beat up CDV photograph of his champion Cincinnati Red Stockings team of 1869. Aside from that item, Guzzi says the family had no other original photographs or documents from his career. It was her understanding that everything was donated after he passed away in 1895. So, a Wright family photo album featuring some of the rarest Harry Wright CDVs in existence showing up in a Butterfield & Butterfield auction in 1997 is curious to say the least. When the CDV album was sold there was absolutely zero scrutiny or mention of where it originated. 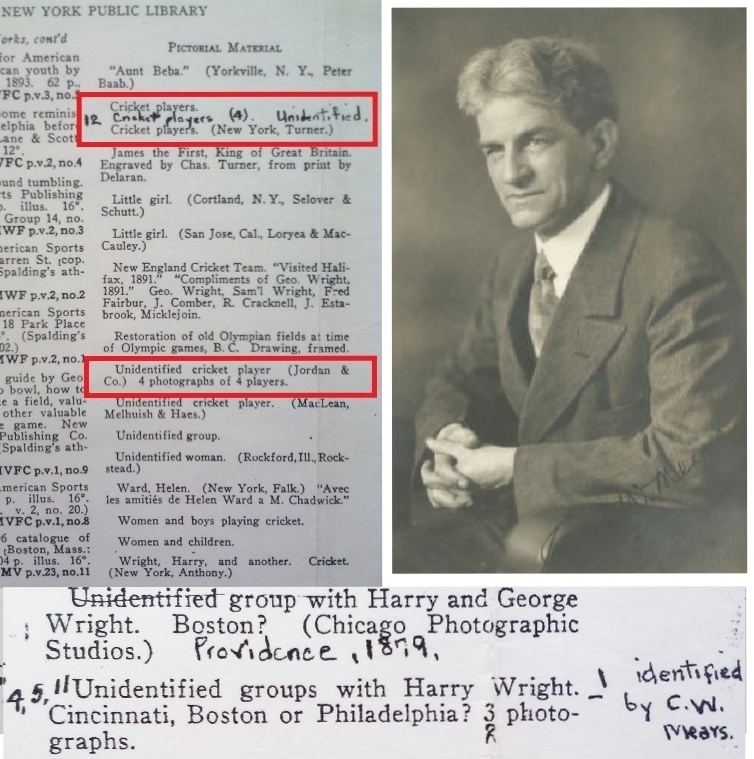 At the time collector Barry Halper still owned his entire collection which featured a wide array of stolen Wright materials ranging from CDVs, cabinet photographs and letters stolen from the NYPLs Wright Correspondence Collection. When Halper sold his collection in 1999 at Sotheby’s, with REA’s Rob Lifson as the head consultant, the market was inundated with stolen materials related to Harry Wright. 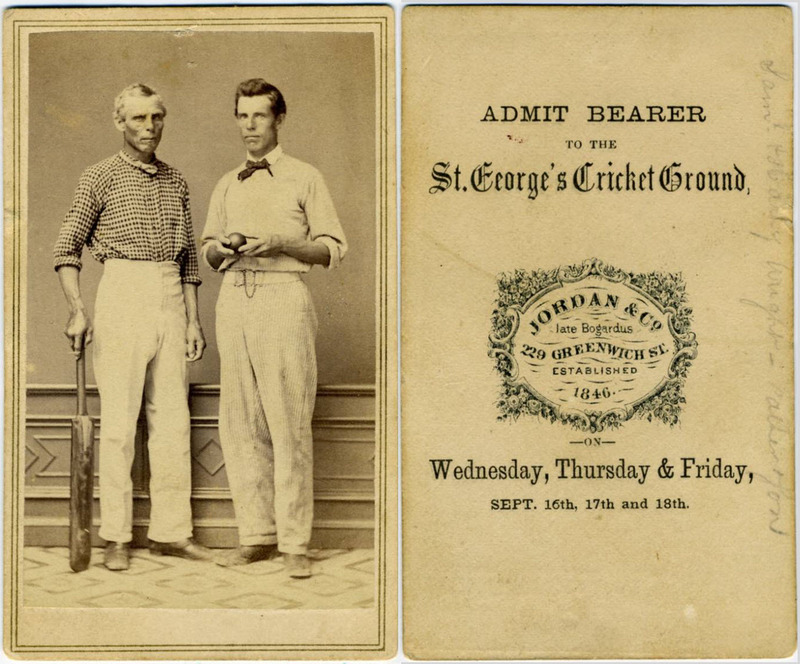 The NYPLs Spalding Collection currently includes four Jordan CDVs with backs denoting they are tickets to the 1863 matches at the St. George's Cricket Grounds. The 1922 inventory notes the inclusion of four unidentified CDVs and one identified as Sam Wright (top). The two CDVs below the Wright duplicates feature cricketer William Hammond. The New York Public Library’s Spalding Collection inventory in 1922 included one entry designating, “Unidentified cricket player (Jordan & Co.) 4 photographs, 4 players” and another handwritten entry added by researcher Charles Mears later in the 1920s identifying an additional group; “Cricket players (4) unidentified,” on the same inventory page. Of the four unidentified photographs of “cricket players” identified in 1922, three had backs identifying them as the 1863 Jordan & Co. “tickets” to the St. George Grounds. 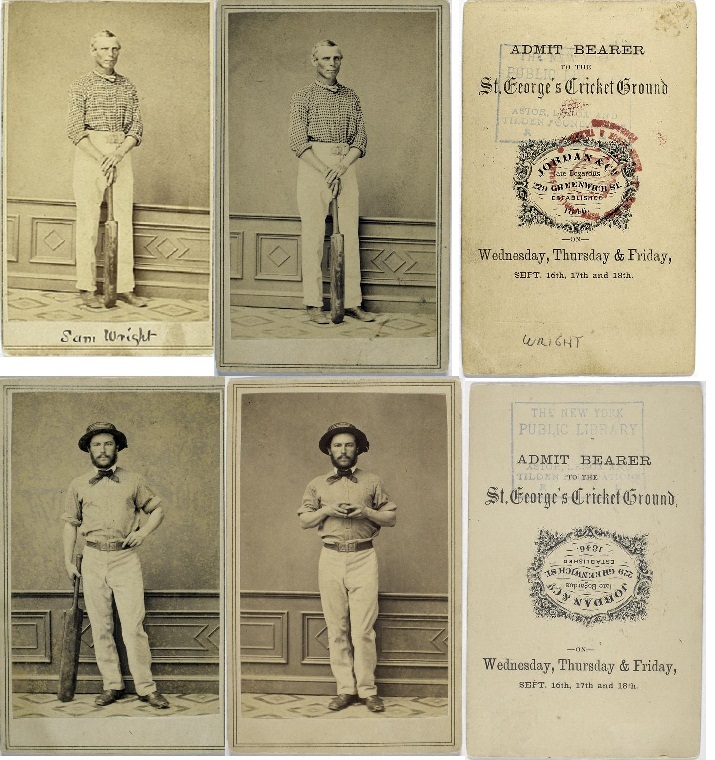 The NYPL collection also features one "non-ticket" Jordan CDV of an "unidentified" cricket player (Crossley) and a Brady CDV of Sam and Harry Wright that bears no NYPL ownership stamps on its reverse. The fourth unidentified example of the Jordan & Co. CDV images is devoid of the “ticket back” and has just a generic “Jordan & Co.” back. Another cricket related image included in the Spalding holdings was an E. T. Anthony CDV shot by Matthew Brady of Harry Wright and his father Sam holding cricket equipment. All of the cricket CDVs are marked with NYPL stamps except for the Brady image which bears no ownership mark of the NYPL. Based upon Charles Mears’ handwritten notations in one of the NYPLs 1922 master inventory booklets of the Spalding Collection there were four unidentified Jordan CDVs and separate entries for one (duplicate) Jordan CDV of Sam Wright (Wright, Sam) with his name identified in ink on the front and another entry for “Wright, Harry, and another. Cricket (New York , Anthony. ),” which was the Brady image of Harry and his father Sam. 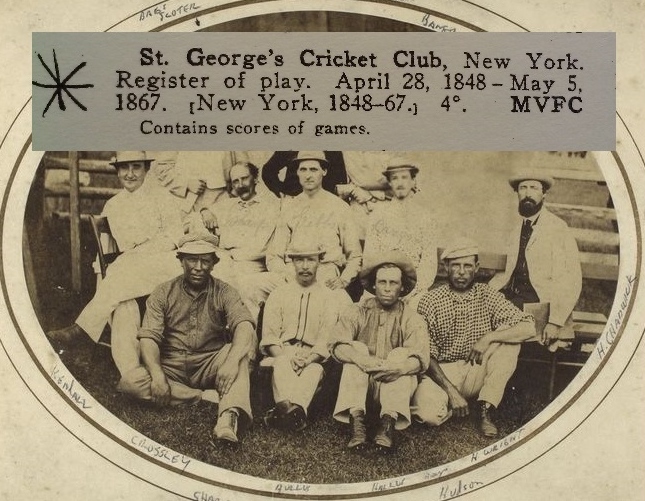 If we take Mears’ notes to encompass the entire cricket related CDVs in the Spalding Collection, it appears that the NYPL is missing another four unidentified cricket player photographs and one duplicate Anthony CDV of Harry and Sam Wright by Brady. (Mears did not identify the unidentified (4) cricket players as CDVs). It also appears that the library is missing another extremely important artifact related to Harry and Sam Wright, the actual St. George’s Cricket Club’s “Register of Play,” the official score book of the club used between 1848 and 1867. That score book would have recorded the matches related to the production of Wright’s Jordan & Co. CDVs and may have offered more clues to researchers. The St. George volume, however, like so many other Wright-related artifacts, is missing from the Spalding Collection along with several important pages that were cut and wrongfully removed from the Knickerbocker Base Ball Club’s score book. Considering REAs claims of the staggering rarity of the Jordan & Co. CDVs, it would appear that a closer look at the population and provenance of the known examples is warranted. This "newly discovered" Jordan & Co. CDV-ticket featuring Sam and Harry Wright appears for sale in REA's Spring Auction. It should be noted that Lifson had no evidence whatsoever to make such a claim, neither from Butterfield & Butterfield Auctions nor from a Wright descendant. In fact, Wright’s last will and testament specifically noted that his entire baseball and sports archive was to be bequeathed to the National League so as to form a “nucleus” of a collection to tell the story of the development of the game. 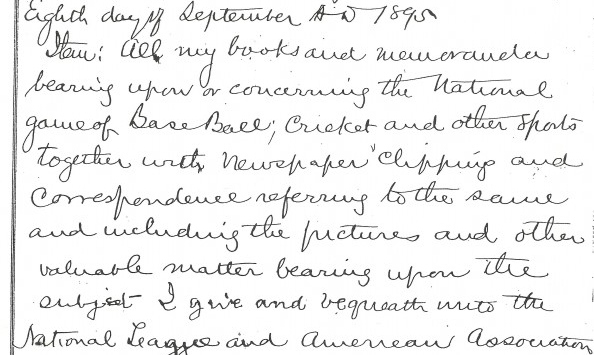 Harry Wright's 1895 codicil to his will, in his own hand, specifies that his executors bequeath pictures related to both cricket and baseball to the National League. Lew Lipset offered the Harry Wright CDV in 1998 with a minimum bid of $600 and identified the entire offering as "The Harry Wright Collection." Based upon the album’s alleged ties to Harry Wright and the Wright family is it possible that the Olbermann-Harry Wright CDV originated from the Spalding Collection and is one of the photos Charles Mears noted was missing from the NYPL? Or could it have originated with Harry’s brother, George, or one of his family members? And regardless of the origins of the CDV, who actually consigned the Wright materials to Butterfield & Butterfield and to Lew Lipset? Despite the hoopla in the auction description, which calls the Harry Wright CDV “The First Baseball Card,” REA is still seeking an opening bid of $50,000. Haulsofshame.com contacted Keith Olbermann to confirm whether or not he is the current consignor of the Wright CDV to the REA sale. Olbermann, a well-known and prolific collector, did not respond to our inquiry but sources indicate that it is more likely that he may have previously traded or sold the card to acquire another item he desired. Several sources said Olbermann rarely, if ever, has sold items from his impressive collection. I think you guys sent out the wrong link. I read the Wright. Olbermann article and it was excellent. Where did it come from? Thin air? How appropriate it would be if Bathtub Boy turned out to have been holding stolen property. Olbermann is one of the most knowledgable guys on early cards. If he unloaded this one it was probably a smart move. I am a distant relative of Samuel Wright, who as far as I can ascertain left Sheffield in 1833 to join the St George Cricket Club of NY NY. I do have in my possession his marriage certificate and some other well researched historical items lodged with the Sheffield Archives. I would be keen to correspond with any other members of the Wright Family, having established that we boast a Gold medal winning tennis player also. To little response, I am a distant descendent of the Wrights. I live in Sheffield and hold the status of being Chairman of Samuel Wrights first club, The Wednesday Cricket Club.